Extending your home is a great way to add value to your property but it often comes with a steep price tag. We’ve looked at the most cost effective ways to expand your home without the need for an expensive build and often with a relatively easy path in terms of planning permission (if required at all) – check this aspect before proceeding! An estate agent survey showed that adding a conversion on average adds more than 12% to the value of a home. This is not a hassle free suggestion as it will involve a certain amount of building work inside the home – with all the associated noise and dust! – and you also will need to make sure that the roof space has sufficient height once strengthening floor joist have raised the floor level. Another consideration is that fact that although you gain a room you will almost certainly be losing quite a lot of space somewhere else if you are adding a staircase. This doesn’t apply if you are using a loft ladder, but then the room becomes far less accessible. In recent years there has also been more regulation involving things like fire doors and wall insulation which have all added to the cost. As a rule of thumb, if you spend £20k on a loft extension you should be looking at adding perhaps twice that to the value of the property. The majority of UK garages are not used for keeping a car – more often they are used just for storage. It is often a relatively straightforward task to convert these by bricking up the entrance (normally including a window) and adding services. The expense and disruption are both low. As part of this option you might also need or want to pave over part of the front garden to maintain or add a parking spaces. Given the value this adds to your home we would suggest doing a paving form of drive (rather than concrete or tarmac) as this looks better but more importantly allows some drainage of rainwater and helps reduce instances of localised flooding. There are some councils considering limiting driveways due to the flooding concerns eg Crawley Borough Council. Often considered a ‘part-time’ building extension! There is little doubt that a well constructed conservatory will add between 5 & 10% to the value of the property. You should avoid it appearing just to be tacked onto the side or back of the home and ideally you should try to make the extra space feel like it is part of the home and part of your downstairs living area. Big opening doors and the same type of flooring will help create this effect. One of the beauties of a log cabin is that if they are 2.5m or less in height, they are exempt from planning conditions even if close to a neighbours fence! Even if they are up to 4 meters high they will invariably get permitted development as the law says you can go up to 4 metres – more details on the Government’s planning portal. 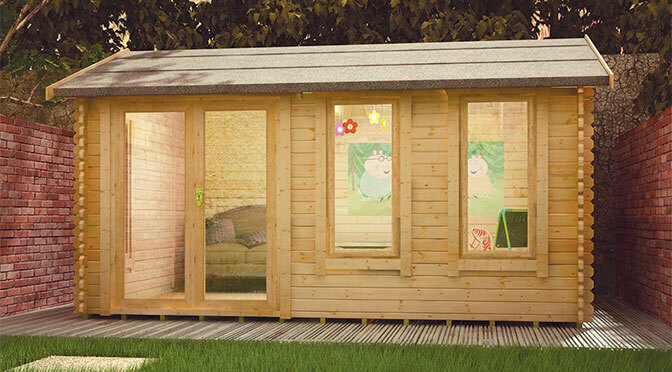 Another benefit of a wooden constructed cabin is the low cost – starting from £1000 you can get yourself a very useable home office or garden building and in very quick time – see some log cabin examples here. Services like electrics, heating and wifi are not difficult to get installed so you can be up-and-running with a new home office in a matter of weeks. Something in the region of 15% of the population work from home full or part-time and this is becoming a really popular option to the lack of home space. Perhaps you don’t need to extend your home and should look instead a space-saving ideas. These can include ideas such as over-head storage cupboards, folding bed, sofa beds and folding tables – there are some great examples of wall beds and cleverly folding furniture here. Even if you do consider any of the options above as ways to extend your living space it is still very worth while to look for space-saving ideas. In a small kitchen it is always worth having a wall folding table to save space and in a small bedroom you can normally make use of the space under a bed with pull-out drawers. New kitchens, bathrooms and house decorations are probably the first ports of call if you want to add value to you home. After this, extending the home with conversions, conservatories and log cabins will all be great ways to add value to your home. A nice list of extension but if you want to invest into your property, I would recommend an orangery. Yes, I agree, the orangeries on your site look amazing!